To be able to connect to the Internet through a telephone line, one modem is not enough. 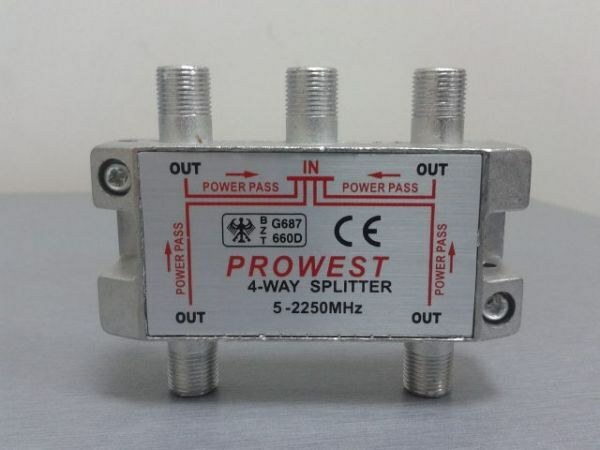 Splitter - a device that will split the signal from the server and the other phone while the Internet connection speed and lack of interference with conversation. Once I developed a regular telephone, no one could come to the idea that the telephone wires ever be used for digital signal transmission. Therefore, for the functioning of the Internet and phone on one line I had to use a special separation device. If a high-frequency signal (Internet, ADSL) will run simultaneously with low-frequency (PSTN), the phone will constantly hear interference in the form of noise (the electronics of the phone will "try" to decode the RF signal). On the other hand, the low frequency component of the signal will "slow down" the transfer of information from the server, because the modem will count bass signals for the mistake should be corrected. To protect both signals (analog telephone and a digital computer) from the mutual influence of the used filter (or splitter) connected between the telephone cable, modem and telephone handset. Externally, the crossover is a small box made of plastic that has one input for the telephone cable and a pair of outputs for camera and modem. Getting on the input frequency band filter divides into 2 parts: one for the telephone signal, the other for the ADSL signal. As a result of division, the device emits for each output socket of the appropriate frequency. Telephone equipment, which includes machines, Fax machines, answering machines, etc., receives frequency range to 3400 Hz, and the modem – all frequencies by 25000 Hz. If the room has several phones on the same cable, the splitter placed at one outlet. In this case I have to pull a separate wire to the ADSL modem outlet. It is not very convenient, since it will have to shift to crossedout) telephone line to the modem and phone can work simultaneously. The problem can be solved through the use of microfilters. These devices have a single output, one input. Such a filter is mounted in front of each telephone handset. Sometimes, for convenience, manufacturers are producing a telephone wire, where already built a microfilter in the form of thickening. In some cases, the device is mounted directly in the junction box. Splitter, in fact, advanced microfilter. The latter works exactly the same as his colleague: divides the frequency range to allow the phone high-frequency signals; and prevents the penetration of low frequencies to the modem.